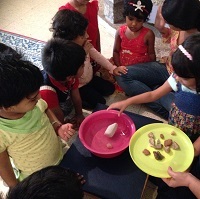 Jigyasa has three preschool programmes which are offered to children between the ages of 12 months and 6 years. For the youngest children who are between 12 months and 24 months, the Mother & Toddler Program is a great start. This is is meant to introduce young children to a school environment with uproariously enjoyable sensory activities! It also provides the opportunity for Moms to meet up and share experiences! The children who are below 2.5 years start on the Toddlers Programme. These children then graduate to the Mixed Age Montessori Environment, usually when they are 2.5 years of age. Children who are between 2.5 years and 6 years start in the Mixed Age Montessori Environment. These children are capable of more advanced activities and have a longer day at school. Children who are in their last year of preschool (Upper KG) have an extended day in which they spend one hour after lunch working on key academic skills in preparation for Grade 1. This is a focussed programme which lasts until 2:30 pm, after which the children go home. 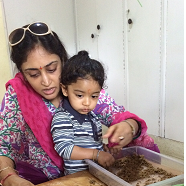 The Mother & Toddler Program at Jigyasa is quickly becoming the talk of Bangalore Town! This is a program which is specially designed for mothers to attend with their children, with the aim of giving the children a whole new world of sensorial experiences. The program is run from Monday to Thursday and enrolment is for one month at a time. Mothers are welcome to attend as many sessions as they want. We also welcome grandparents and fathers to attend with the little ones! This programme is a beautiful introduction to school life. The focus here is on helping children develop social bonds with their peer group and adults within the structured environment of a preschool. 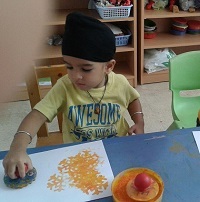 The activities that the children engage in focus on refining their senses and motor skills. The aim of this programme is to make children comfortable in their new surroundings and instill in them the independence needed for the later stages in life. Children usually stay in the Toddlers Environment only as long as they need to - we do not have any hard and fast rules regarding the amount of time that a child spends in this environment, and the transition to the Mixed Age Environment is decided on a case by case basis. The Mixed Age Environment is a fully equipped Montessori environment which provides opportunities to develop the key skills required for further education. In this environment, children acquire skills related to literacy, numeracy, fine and gross motor skills, physical concepts and music. The focus is on providing limitless opportunities for each child to work at his or her own pace, thereby developing skills in a manner which is most suited to each individual. Teachers act as facilitators, ensuring that children are gently being pushed to scale their own learning mountains. The curriculum is implemented using Montessori and Reggio Emilia methods. Multi-sensory explorers: Children learn through their senses and therefore refining their senses through scientifically planned sensory experiences promotes learning. Eager Listeners: Development of keen listening skills through a variety of activities sensitize children to very fine differences in sounds which enhances language development and musicality. Free Flow: Children are born with natural instincts and the best learning happens when they are allowed to follow these instincts...learning thus acquired gets embedded for life. Eurhythmics: A form of education which uses music and movement not only for development of balance and coordination but to give a deeper understanding of concepts. World Travellers: Children understand the World and its people...learning to enjoy similarities and accept differences...thereby becoming global citizens. Little Entrepreneurs: The most enjoyable experiences which develop economic awareness through role play! Exploration & Discovery: The wondrous enchantment that children experience as they discover truths about their world...taking their thinking to realms beyond here and now. Each of our children come into this world with an inbuilt learning programme provided by nature and therefore need some control over the direction of their learning. An effective learning environment will support the unfolding of this programme. In order to make this possible, children must be able to learn through experiences of touching, moving, listening, seeing and hearing. Children have a relationship with other children and with different physical material in their environment which they must be allowed to explore. The carefully planned learning environment is crucial to both Reggio Emilia and Montessori pedagogy and is often referred to as 'the third teacher'. The classrooms are extended learning spaces, which we, the educators, plan and equip in order to enable the children to work at skills required to reach their developmental goals with a minimum of adult imposition. Lessons thus learnt are never forgotten.